As the returning reader will know, I've been on a bit of a tomato rampage recently. Guess what, here's another recipe that's using tomatoes. This time they're pan fried and not oven roasted so at least there's some variation. I was in the mood for a steak sandwich but wanted to freestyle the concept a little bit. This is what I came up with and I think it worked well. It is definitively juicier than what the steak sandwiches I normally cook. Heat the oil in a frying pan on a medium heat. Fry the steak until nicely browned. Remove from the pan and keep warm. Add the onion, pepper and spice to the same pan. Fry, stirring continually, until the onion starts to brown. Add the tomatoes and simmer until the sauce thickens nicely - about 15 minutes. Stir now and then and feel free to break up the tomatoes. Once the tomato sauce is nice and thick return the meat to the pan and stir it in together with the parsley. 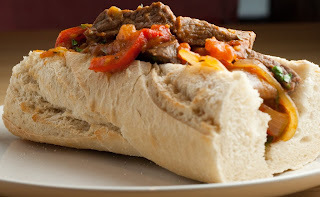 Spoon the steak and tomato mixture into the baguettes. Yummy, I love this one! My husband is a big fan of fancy sandwiches and I will make this one for him for sure! What does "pan fried" mean? I always fry in a pan. My definition of it is that you use less oil than if you were to deep fry it. I guess that shallow frying could be another way of writing it. You got 'sautéing' as well, which I would characterise as being pan frying but at a much higher heat and for a shorter time. Trevlig helg pa dig sjalv! Kryddburken: Tackar sa mycket! Det ar nastan sa att man rodnar :) Tack for berommet, din ar en av mina Svenska favoritbloggar. Hoppas att du har haft en bra helg! Goodshoeday: Many thanks and I hope that you'll enjoy them when you try them. They are just that extra bit creamier in the texture, something that makes them a bit different, not to say more interesting. Jisses, vilken kanonmacka. Det skulle jag gärna sätta tänderna i =). Synd att du inte hittar arraksessens i England, för dammsugare är ju så himla goda. Kul att du gillade receptet. Kanske nagot att prova nagon gang i framtiden? Ja jag vet. Nu far jag noja mig med att tigga vanner och bekanta att kopa en box eller tva nar de aker till IKEA istallet. Kul att du tittade in, hoppas att du gillade vad du sag och att du kommer tillbaka.